In the much hyped "Battle of Brooklyn" that took place last night at New York's Barclays Center, Paulie Malignaggi pulled away from Zab Judah over 12 rounds, winning a wide decision in a bout for the NABF welter strap to headline a big show. Judah, 42-9 (29), dropped Malignaggi, 33-5 (7), in the second but that was the sole positive the former two-weight world champion took from this contest as "Super Judah" looked every bit of his 36 years of age. 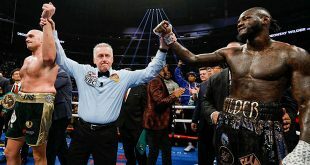 The southpaw simply couldn't keep up with the pace that the 33 year old Malignaggi set, as the "Magic Man" was on his toes the entire bout, never letting Judah get in range of get set to go on the offensive. Not surprisingly, Malignaggi swept the cards by scores of 117-110, 117-110, 116-111. 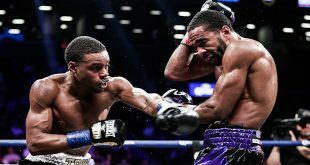 In a battle of southpaws for the WBA light middle title, Erislandy Lara, 19-1-2 (12), outboxed former belt owner Austin Trout, 26-2 (14), over 12 rounds by scores of 118-109, 117-110, 117-110. Trout tried to come to grips with the Cuban but had difficulty dealing with the more mobile Lara, who countered the former champion ceaselessly. Lara nailed Trout in the 11th frame, dropping the New Mexico man, who beat the count and finished the fight on his feet. In a massive upset, relatively inexperienced contender Shawn Porter, 23-0-1 (14), toppled seasoned IBF welter champ Devon Alexander, 25-2 (14), by margins of 116-112, 116-112, 115-113 after 12 rounds. Porter relentlessly attacked the champion, tiring Alexander and battering him around the ring. Alexander was surprisingly unable to meet the challenge posed by the unheralded Porter and loses the title after in his first defense. Porter must now defend against mandatory challenger Kell Brook of the UK. In another unexpected outcome, WBC super middle titlist Sakio Bika, 32-5-3 (21), was held to a draw by another relatively inexperienced contender, Anthony Dirrell, 26-0-1 (22), with scores of 116-110, 112-114 and 113-113. Bika was dropped in the fifth and lost a point for a low blow in the 11th in what was a very rough and tumble contest. Dirrell started well but faded down the stretch, having never previously been past the seventh round. 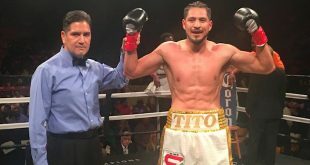 Bika keeps the WBC title.